Firstly, imagine Airsofting without gloves! Maybe you have? Ever taken a hit on the knuckles, ouch! Better get some protection then. So an essential item for any Airsofters kitbag should be gloves, but which ones? In increasingly common use by the military (and Private Operatives) the Oakley SI (Standard Issue) Assault Gloves are finding themselves new homes in the world of Airsofting. 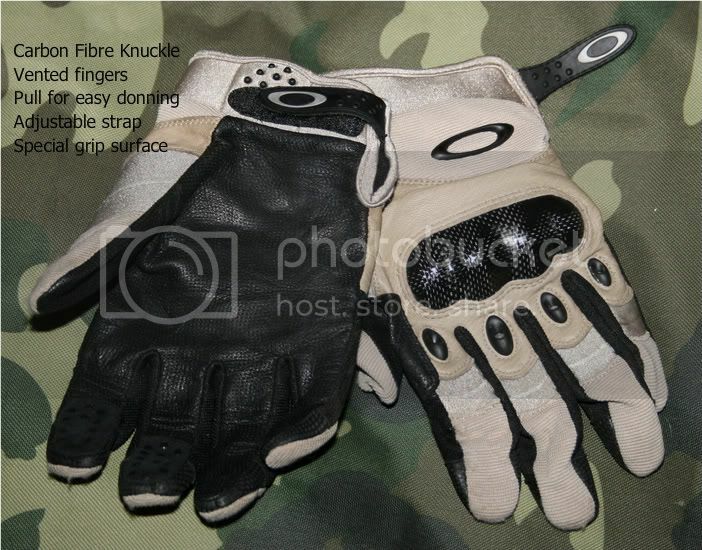 Perhaps over-kill for Airsofting, these gloves should protect those delicate hands & pinkies from most things the environment can throw, drop or fire at them. The excellent carbon fibre ‘knuckle dusters’ although take a little time to break in and become comfortable are practically guaranteed to protect the exposed knuckles to any BB hits in battle. I did find some slight rubbing against the knuckle occurred on the right glove but not the left, which seems to have disappeared after a few skirmishes with them. A strong durable palm with a good textured finish compliments these gloves. Look around the web and you will see various warnings about the fit of these gloves. Generally people are told to get the next size up from what they would normally wear. So if you’re a medium, order large; this is good advice as the fit across the knuckles is best described as snug. For me however this leaves me too much room in the fingers with them being a little long. The Index and middle fingers on left & right gloves have an extra textured area for increased grip (described in the blurb as a high friction surface). And if you really needed to know, a nose wipe area on the thumb! Skirmishing for the day in these gloves is comfortable and I have yet to get too hot in them thanks to the breathability of the fabric and ‘O’ shaped finger vents. They have saved my hands on more than one occasion from grazes on walls, trees and hits etc. Don’t get me wrong, these are truly excellent gloves, but the price is steep in some places so shop around for good prices (I’ve seen them as cheap as £25 but as expensive as £40 odd? One shop would only sell them if you where a bona fide member of the armed forces or security personnel!). It’s up to you to justify the outlay against the much cheaper China knock-offs. I’ve seen a pair and tried them on (the fit was better for me than the Oakley’s) but how hard wearing is another matter all together. The originals come with Oakley’s famous guarantee, try and obtain free replacements from a China made clone. If you’re a geardo and must have all the latest kit then you’ve probably already got some, otherwise I’m sure a cheaper alternative could be found. Let down by price otherwise these are excellent gloves. [6 stars] out of 10 Look else where! Hard wearing mico-vented leather reinforced palm. Reinforced with Kevlar & Carbon fibre knuckle protection. 4-way stretch material and Airprene® joint panels for superior fit and dexterity. [*]Non-restrictive Airprene® mid-height cuff with secure Velcro® closure.Available in Khaki & Black.